Volkswagen wants to prove that its Atlas is trail-ready. 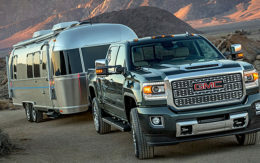 That’s why it’s showing off an adventure-focused special-edition concept of its large SUV that’s appropriately dubbed the Basecamp. The German automaker will have the rugged concept on display at the New York International Auto Show this week. The Basecamp concept is meant to showcase how Atlas owners can customize the vehicle for various outdoor activities. Created by VW designer Alex Earle, a passionate cyclist, the build has a slight bias toward endurance mountain bikers. The base vehicle is a Volkswagen Atlas SEL Premium trim. It’s dressed with a matte gray and black finish, orange accents and unique Basecamp badges. Atlas SEL Premiums come standard with a 3.6-liter VR6 engine that delivers 276 horsepower and 266 pound-feet of torque. It also has an eight-speed transmission, as well as VW’s 4Motion all-wheel drive. The Atlas rides on a set of unreleased fifteen52 Traverse MX Concept wheels, as well as 265/70R17 all-terrain tires. A custom body kit from Air Design and an H&R lift kit add an extra 1.5 inches of ground clearance on top of the standard 8 inches. On the roof is a Slimline II roof rack system from Front Runner with specific holders for two bikes as well as off-road LED light bars on the front and back. Protective add-ons from Volkswagen Accessories in the interior round out the rugged look. Though the SUV itself is equipped for the backcountry, the concept also highlights its towing ability. There is an off-road-capable Hive EX compact expedition trailer attached to its hitch. It has the same wheels and all-terrain tires as the Atlas. Inside the trailer are a queen-size bed and a separate pullout canopy as well as a kitchenette with a stove, sink and refrigerator/freezer combo. There are even a portable toilet, a hot water shower and a self-contained water tank. VW didn’t say if, or when, the Basecamp Concept would be available as a real Atlas upgrade but in addition to the New York auto show, the automaker plans to show the build at at the 2019 SEMA Show in Las Vegas in October.